Rik van Steenbergen, Rik van Looy, Jan Janssen, Wim van Est, Hennie Kuiper and Peter Post were some of the most colorful and dominating riders of an era that produced many of the sport’s greatest-ever champions. 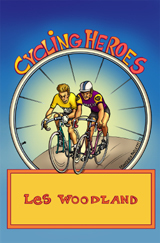 In this book Woodland has collected their and other riders’ precious and fascinating recollections, some going back to a time of leather saddles, cloth caps and spare tires wrapped over riders’ shoulders; when screaming fans packed smoke-filled velodromes to see their heroes up close; when a stage of the Tour de France could take more than eleven hours. Woodland has filled in his portrait of racing’s golden years with the stories of those riders who were either too far away or time got there first, including Fausto Coppi, Louison Bobet, Jacques Anquetil and Raymond Poulidor. Moreover, Woodland is a wonderful raconteur and Cycling Heroes is filled with wonderful bits of bike history and lore that fans of cycling's premier writer have come to love. Join Les Woodland on a captivating journey back to the golden age of racing. Les Woodland has been cycling for 50 years and has been writing about cycling since 1965, when he wrote his first reports for the British publication Cycling. Since then he has been a prolific contributor to newspapers, magazines and radio stations in the U.K. and Belgium. Mr. Woodland, who currently lives in France, speaks several of the languages of cycling: English, Dutch and French. At last count he has written 25 books, nearly all about cycling.